In the middle of all this media mayhem, Jelena's credentials as a tennis player tend to be overlooked. She was the top-ranked junior in the world at the age of 15 and then, a year later, she announced herself to the public by beating world no 1 Martina Hingis at Wimbledon in the opening round. Jelena had come through the qualifying competition, and was ranked 129 at that time. By the end of her run - she was stopped at the quarterfinals - she had climbed to 37, and she never looked back. Jelena's final breakthrough took place at Rome in 2001. There she won her first title at one of the big-money, top-tier events, and, having developed the winning habit, she has been doing it on a regualar basis ever since. After that, she won the Toyota Princess Cup at Japan, the Kremlin Cup at Moscow, the Sarasota Open at Florida and after she had won Birmingham she finally won a tournament on every possible surface! On october, 8, 2001 she entered the Top 10 for the first time in her career, and settled down there, and if she announces the Top 10 as her home, it's meant more literally than with any other player! She has gradually tought herself to try to enjoy life away from the courts, and she likes the same pastimes as any 19-year-old. She loves to shop, she loves movies, music and most of all she loves her boyfriend: Brazilian Formular 1 star Enrique Bernoldi. Jelena Dokić (Serbian: Јелена Докић; born 12 April 1983) is an Australian female professional tennis player. During the height of her career, she played for Serbia and Montenegro (Federal Republic of Yugoslavia prior to February 2003) and reached a career-high ranking of World No. 4 on 19 August 2002. After several family-related difficulties (mostly involving her father), she slowly slipped down the rankings in 2006. She made a serious return to tennis in 2008, and after winning three ITF tournaments that year, rose to World No. 187 going into the 2009 Australian Open. She finished 2009 in the top 100, but declined in 2010. Her current 2011 season has seen a resurgence in Dokić's form and abilities. The highlights of Dokić's career include reaching the semifinals at Wimbledon and the Sydney Olympics in 2000 and reaching the quarterfinals at the French Open in 2002 and the Australian Open in 2009. Other highlights include beating several former World No. 1 players: Martina Hingis in the first round of Wimbledon in 1999, Venus Williams at the 2000 Italian Open and Kim Clijsters at the 2003 Zürich Open. Other high-calibre players whom Dokić has defeated include Caroline Wozniacki, Jelena Janković, Monica Seles, Justine Henin, Amélie Mauresmo, Mary Pierce, Elena Dementieva, Francesca Schiavone, Anna Chakvetadze and Jennifer Capriati. Dokić is also one of the few women on the WTA tour who has won WTA-Tier Tournaments on all surfaces: hard, clay, grass and carpet. Jelena was born in Osijek, Croatia, Yugoslavia to a Serbian father Damir Dokić and a Croatian mother Ljiljana. She has a younger brother, Savo, who is eight years her junior. Her family lived in Osijek till June 1991, when they decided to leave due to the civil war. They settled in Sombor, Serbia, for a short time and later, in 1994, emigrated to Australia. From 1994, they lived in Fairfield, a suburb of Sydney, where she attended Fairfield High School. 1999Dokić started the year by teaming up with Mark Philippoussis to win the Hopman Cup title. To date, it is Australia's lone victory at the event. 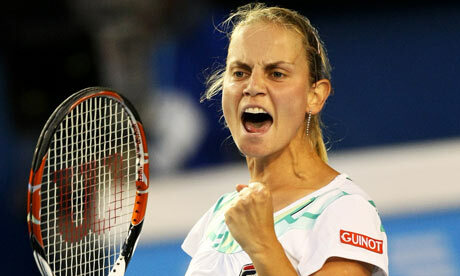 She then received a wildcard into the Australian Open, winning two rounds before losing 6–1, 6–2 to world No. 1 Martina Hingis. At Wimbledon, Dokić made her professional breakthrough. As a qualifier, she caused one of the biggest upsets in tennis history, defeating World No. 1 Hingis 6–2, 6–0, in the first round. Ranked World No. 129 at the time, she was the lowest-ranked player to have defeated the top seed in a Grand Slam tournament during the open era. She also defeated ninth-seeded Mary Pierce in straight sets before losing 6–3, 1–6, 6–3 to Alexandra Stevenson in the quarterfinals. Dokić also reached her first WTA doubles final with Amanda Coetzer in Tokyo. During 1999, Dokić jumped 298 spots, finishing the year at World No. 43. Dokić was knocked out of the Brisbane International by Amélie Mauresmo in straight sets in the first round. Dokić was up 5–3 in the first set before Mauresmo came back to win the tiebreak 11–9. In the second set, Dokić was down 3–5 but rallied to lead 6–5 before Mauresmo won the set in a tiebreak, 7–5. Dokić then received a qualification wildcard into the Moorilla Hobart International tournament but withdrew before her first match because of an Achilles tendon injury. Dokić won her first round match at the 2009 Australian Open against Tamira Paszek of Austria, 6–2, 3–6, 6–4. It was her first Grand Slam match win since 2003. She then defeated World No. 17 Anna Chakvetadze in the second round, 6–4, 6–7, 6–3 and 11th-seeded Caroline Wozniacki of Denmark in the third round 3–6, 6–1, 6–2. This was the first time she had reached the fourth round of the Australian Open. Dokić then advanced to the quarterfinals of a Grand Slam tournament for the first time since 2002 after defeating 29th-seeded Alisa Kleybanova 7–5, 5–7, 8–6. Dokić's run ended when she was defeated by Dinara Safina in the quarter-finals 6–4, 4–6, 6–4. Because of this tournament, her ranking improved to World No. 91. In an interview after her first-round win at the Australian Open, Dokić said that she still has no contact with her father, but is building relationships again with her mother and younger brother, and that she has been dating her boyfriend, Tin Bikić, for five years. In Fed Cup, Australia was in the Fed Cup Asia/Oceania Zone Group I. Dokić defeated all three of her opponents in straight sets, Lee Jin-A of Korea, Suchanun Viratprasert of Thailand, and Diane Hollands of New Zealand. Australia advanced into the World Group II Playoffs in April. At the Cellular South Cup in Memphis, Tennessee, Dokić won two qualifying matches to reach the main draw, where she lost in the first round to top-seeded Wozniacki 6–1, 6–2 in 48 minutes. Her next tournament was the BNP Paribas Open, a Premier Mandatory event in Indian Wells, California, where she lost to American Jill Craybas in the first round. Dokić received a wildcard for the main draw of another Premier Mandatory event, the Sony Ericsson Open in Key Biscayne, Florida. She defeated Romanian Edina Gallovits in the first round before losing to 13th-seeded Wozniacki in the second round 6–3, 5–7, 6–2 on Wozniacki's fourth match point. Dokić withdrew from the MPS Group Championships in Ponte Vedra Beach, Florida and the Family Circle Cup in Charleston, South Carolina, citing fatigue. Dokić then won the second singles rubber of Australia's World Group II Fed Cup quarterfinal tie against Switzerland in Mildura, Australia. Originally scheduled to play in the 2009 Internazionali BNL d'Italia in early May, she instead appeared as the number 1 seed in the $100,000 ITF event at Bucharest but lost in the semifinals to Andrea Petkovic 6–1, 3–6, 6–1. She then participated on the 2009 Warsaw Open, which was the last WTA Premier event before the French Open but lost in the first round to qualifier Ioana Raluca Olaru. She then played the 2009 French Open. In the first round, she beat Karolina Šprem by 3–6, 6–1, 6–2, her first win in the French Open since 2003. In the second round she played world no.4 Elena Dementieva. She led by 6–2 4–3 before retiring due to a lower back injury. She also played doubles, partnering with Alisa Kleybanova, they defeated Petra Cetkovská and Carla Suárez Navarro in the first round. They were scheduled to play world no.1s in doubles, Cara Black and Liezel Huber, in the second round but withdrew because of the injury. Her injury forced her to miss Wimbledon warming up tournaments, but Dokić still appeared at the 2009 Wimbledon Championships. She lost against qualifier Tatjana Malek in the first round 6–3, 5–7, 2–6 after serving 16 double faults. Dokić was then diagnosed as suffering from glandular fever and had to withdraw from Swedish Open in Båstad. She was ordered to rest for another fortnight and planned to get back on court on hard-court tournaments leading up to 2009 US Open. However, she did not make any appearance at the 2009 US Open Series.